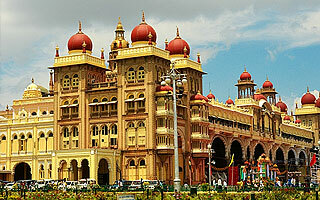 Sothern Golden Triangle covering Bangalore, Mysore and Ooty is amalgamation of some of the finest attractions of India. You will see a glimpse of modern technology and architecture in Bangaluru, ancient royal style architecture and beautiful Vrindawan garden in Mysore and finally a destination which is blessed with incredible beauty of nature Ooty. After breakfast, get ready for Bangalore Sightseeing. Bangalore is also known as the City of Garden. Your visit to Bull Temple will surely make your moment in the city an adorable time. In the sacred place of worship you will observe the Monolithic Deity which features various devotees from various parts of the world. After breakfast, check-out from the hotel and drive towards the city of Mysore. En-route you will visit Sri Rangapatnam. The site was served as Summer Palace of Tipu Sultan in 18th Century. On the arrival at Mysore, check-in to the hotel. After breakfast, check-out from the hotel and drive to Bangalore. On the arrival at Bangalore, you will transfer to Airport or Railway station by our representative for further departure. Tour ends.